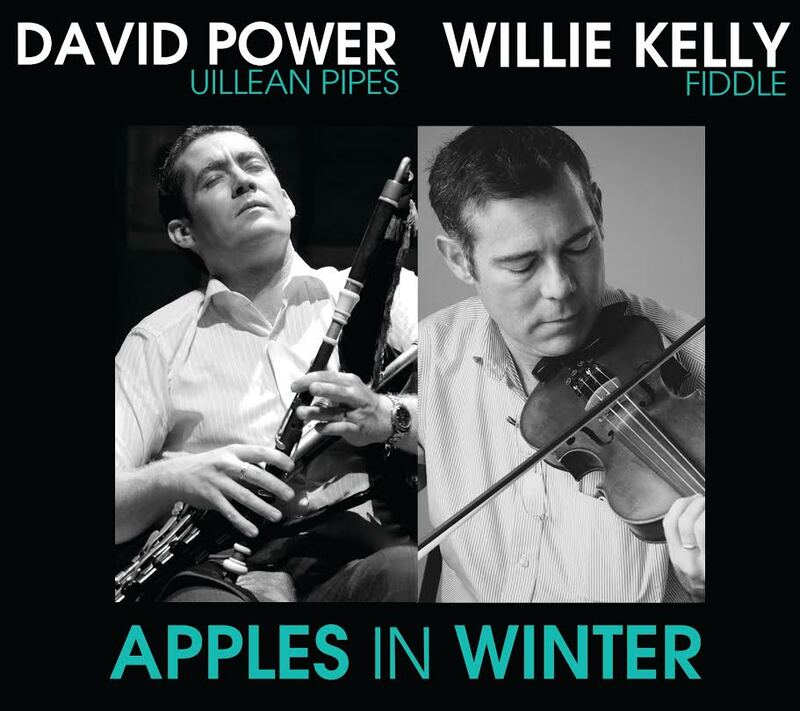 We are delighted to welcome the phenomenal duo of David Power and Willie Kelly to play music from their album “Apples in Winter”. David Power is one of Ireland’s foremost musicians on the uilleann pipes. Fiddler, Willie Kelly was born in the Bronx to a musical family from Ireland and is an extremely well-respected player and teacher. 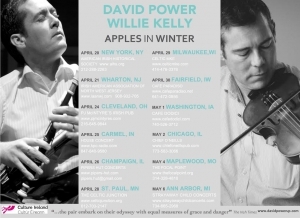 Together, they are embarking on a selective tour beginning in New York and on through the mid-western United States with their album Apples in Winter. The tour promises performances of pure quality; moving and deeply felt Irish traditional music at its best. David Power, from Co. Waterford, Ireland, toured American performing arts centers with the Masters of Tradition for three consecutive years, appeared on Broadway in the Eugene O’Neill play A Touch of the Poet, starring Gabriel Byrne, and has performed with poets Dermot Bolger, Seamus Heaney, Kerry Hardie and others. He has three solo piping recordings: My Love is in America, Cuaichín Ghleann Neifín and The eighteen Moloney. He plays with Ciarán Somers in the group Pipers Union and in duet shows with Willie Kelly and with Martin Hayes. Willie Kelly, based in New Jersey, has performed extensively with renowned Galway flute players, Mike Rafferty and Jack Coen, both National Heritage Fellowship award winners. He accompanied both Mike and Jack at their respective induction concerts and has played at the Smithsonian Festival of Folklife in D.C. In 2009, Willie released a highly acclaimed duet CD with Mike Rafferty called The New Broom. More recently he recorded with concertina player Dymphna O’Sullivan as a guest on the recordings Bean Cairdin and Enriched. David and Willie recorded Apples in Winter at Noreside Music – Yonkers, New York for release in springtime 2016.